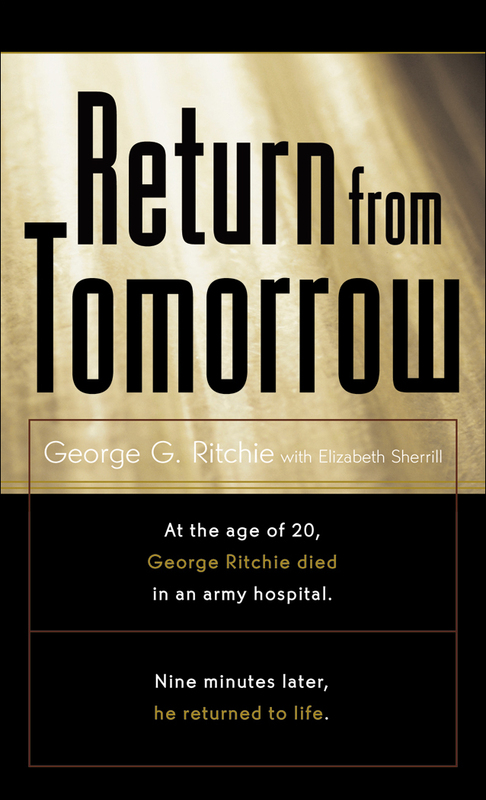 At the age of 20, George Ritchie died in the army hospital. Nine minutes later, he returned to life. At the age of twenty, George Ritchie died in an army hospital. Nine minutes later, he returned to life. What happened to him during those minutes was so compelling, it changed his life forever. In Return from Tomorrow, he tells of his out-of-the-body encounter with other nonphysical beings, his travel through different dimensions of time and space, and ultimately, his transforming meeting with the Light of the world, the Son of God. Ritchie's amazing experience not only altered his view of eternity-it has since directed and governed his entire life. One of the most startling and hopeful descriptions of the realm beyond, Return from Tomorrow may change your life for the better, too! George G. Ritchie, M.D., has held positions as president of the Richmond Academy of General Practice; chairman of the Department of Psychiatry of Towers Hospital; and founder and president of the Universal Youth Corps, Inc. He lives in Virginia. Return from Tomorrow by George C. Ritchie, Elizabeth Sherrill was published by Revell in March 1988 and is our 17669th best seller. The ISBN for Return from Tomorrow is 9780800784126. Be the first to review Return from Tomorrow! Got a question? No problem! Just click here to ask us about Return from Tomorrow.